Angela wondered if Danny knew about this. But then again maybe Danny was OK with not marrying a woman old enough to be his mother. She remembered Danny complaining, “She never lets me take the driver’s seat, so to speak, or drive the car for that matter.” She remembered that Danny had also refused to wear the “Cougar Snack” T-shirt Desdemona had bought him. Noticing one of the tennis pros approaching, Angela smiled brightly and waved at him. “What are you doing?” Desdemona grimaced. She quickly stuffed both Angela’s and her things into her own tennis bag, avoiding eye contact with the pro. “Let’s go!” Desdemona whispered, grabbing Angela tightly by the arm. “Oh, trust me, we were more than friends,” Desdemona said tightening her grip on Angela’s arm. “Listen, hon, we need to get out of here,” Desdemona added, still whispering. “Why?” Angela asked. “Hi Toby!” she smiled and waved again. Toby had always been so nice to her during her twice weekly private tennis lessons in the past. Of course, Art and she agreed to drop their club membership right away when they divided to divorce. They knew they could not afford it. It was so nice to be back at the club as Desdemona’s guest, and to see all her old friends again. Though, come to think of it, Desdemona had insisted on coming in a side entrance, rushing to an open court and refusing to talk to anyone. Angela noticed that Toby did not wear his usual smile. He was striding toward them with a furrowed brow. And there was Calvin, the club manager, a few steps behind Toby, fast-walking their way, clipboard in hand and a stern frown on his face. “RUN!” Desdemona shouted, leaping over the bench and sprinting toward tennis court gate. Not knowing what to do, Angela ran to catch up with Desdemona, though making sure to look back, smile and shrug apologetically at the two men marching toward them. “Exactly how far behind are you on your dues, Des?” she panted as the two of them raced across the grass toward the club parking lot, items spilling from Desdemona’s bag. Angela collected the fallen sunglasses, balls and visors quickly and held them to her chest as she ran. “How far behind on your dues?” she tried again between breaths. “I’m not exactly a member anymore,” Desdemona muttered as the two of them hopped into Desdemona’s newly leased Lexus. Desdemona squealed out of the parking lot swerving around the homeowners’ association security vehicle, which apparently had been called to the scene in order to catch the pair of trespassers. “Later, suckers!” Desdemona shouted out the window, cutting through the exit gate just as it slowly began to close in order to block their exit. Desdemona laughed. She loved breaking the rules, always had, even when Angela and she had been sorority sisters at CU. “Temporary Orders, is that something I am going to have to do too?” Angela wondered aloud. “Well, you definitely should,” Desdemona told her. “Never miss a chance to go to court and let your ex have it. That’s my philosophy!” Desdemona smiled. Angela shrugged and shook her head. “Because it’s worth it!” Desdemona put the pedal to the metal, burning rubber as they sped down the tree-lined streets of her upscale suburban neighborhood. 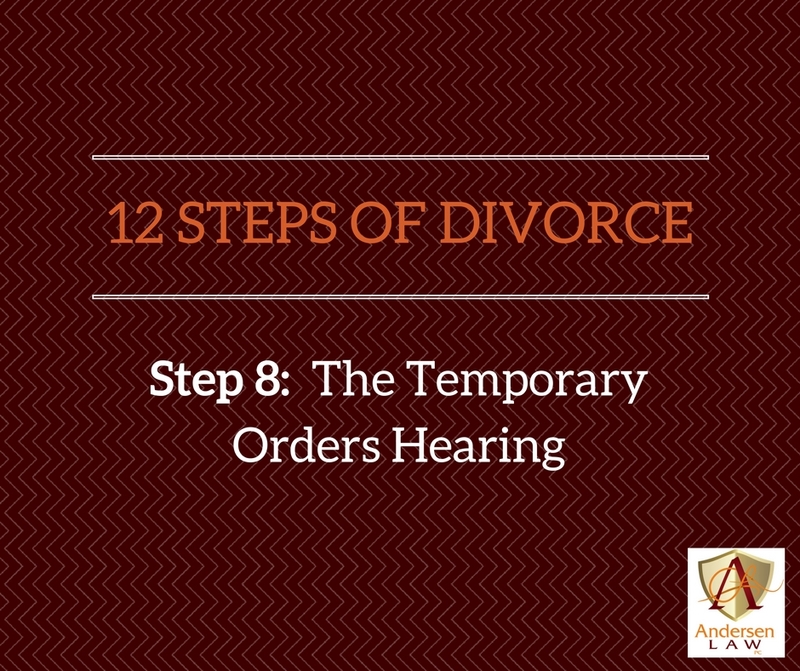 Angela’s attorney explained that a Temporary Orders hearing occurred when the parties had issues that could not wait until the final Permanent Orders hearing in their case. “It’s not exactly like that,” the attorney explained. “Whew, because I do not want 12 angry men deciding my divorce,” Angela said as she breathed a sigh of relief. “Well, you may not want one busy judge either,” her attorney said. “But Desdemona says we have a right to our day in court,” Angela retorted, thinking twice the minute the words left her mouth. She knew that anything her friend Desdemona recommended should be taken with a pillar of salt. Besides, her attorney had told her to fire the committee of friends and family giving her well-meaning advice throughout the divorce. Everyone had a strong opinion, a harsh word about her attorney and her ex, and seemed to know a friend, cousin or neighbor who got everything handed to them for free, whose divorce had been better, faster, cheaper, a walk in the park. 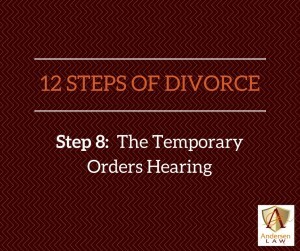 Angela’s attorney explained that she was close to having negotiated temporary support for the kids and her, as well as living arrangements, parenting time, and a discovery and mediation schedule that made a temporary orders hearing unnecessary. When the attorney added that avoiding such a hearing could save Angela thousands of dollars, it was music to her ears. Meanwhile, Desdemona’s hearing was not the fun experience she had hoped. The Joint Trial Management Certificate, Exhibit Books, Subpoenas and other details meant hours of attorney and legal assistant time. That meant a big bill for Desdemona and another bill just as big for Draco and his attorney. The magistrate had scolded both parties for their inability to agree on basic things and put the children first. She had assessed sanctions against both of them for their refusal to turn over basic discovery. She had even ordered the attorneys to go out to lunch together and get some mentoring at the bar association because the attorneys had been bickering just as brutally as Desdemona and Draco. Angela sometimes wondered why Desdemona and she had ever been friends to begin with. Her friend’s superficiality and indifference to legal realities was astounding. “Desdemona,” she attempted, “my attorney said court is not just a chance to rant against your ex. We live in a ‘no fault’ state, the court does not care which party is the one to cause the divorce, so infidelity as a general rule is not relevant in a hearing – unless he was spending thousands of dollars on travel or gambling or similar marital waste. Angela gave up. Desdemona did not get it and she probably never would. Art was stymied. Angela was a school teacher and hardly a rule breaking rebel. Maybe divorce was changing her, he wondered. Then he remembered that the only time Angela ever did get in trouble, Desdemona was sure to be the instigator. Questions for September: When it comes to mediation, do you have to haggle?